FOLLOW THEM FOR FUN! LISTEN TO BLUE WORLD FOR STRATEGIC ACTIONABLE INTELLIGENCE! It’s another massive report that gets turbo-charged with 37k in upward revisions to the last two months! Let’s get straight to the numbers. We see 213k on the marquee and 202k came from the Private Sector, which keeps that average at 211k with half of 2018 in the books. The Participation Rate double-ticked to 62.9, the Total Employed jumped another 100k, the Labor Force ballooned by 601k, and the Diffusion Indexes for both Manufacturing and the Private Sector astonishingly remain in the mid-60’s! If there is any downside at all it’s that wage inflation remains elusive, but that is also a side effect of a point about workers coming back to the work force that we’ll detail below. The labor market is three dimensional and cannot be adequately analyzed by a two-dimensional headline of two or three stats. For example, there will be those that point to the Unemployment Rate ticking up to 4% with the number of Unemployed growing by half a million. They are either disingenuous or simply misinformed. 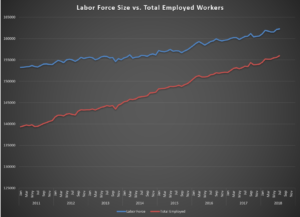 It is a crucial yet little understood method of the unemployment report that not all of those without jobs are counted as “unemployed.” In order to be unemployed for reporting purposes one must also be a member of the Labor Force. One is only a member of the Labor Force IF they have actively looked for employment recently. In other words, we are only “unemployed” if we want work, are actively looking for work, and cannot find work. 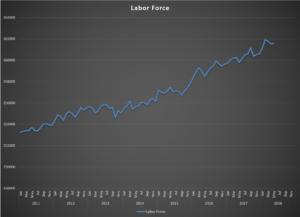 Table A-15 of the release, Alternative Measures of Labor Underutilization, tracks those who are considered Not in the Labor Force, marginally attached and discouraged from even seeking a job. When we hear talk of the “true” unemployed rate, that’s what they mean. 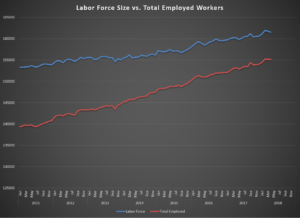 This is why Blue World puts such heavy emphasis on the dynamic relationship of changes between the size of the Labor Force, those Not in the Labor Force, Total Employed, Total Unemployed, and the Participation Rate. Today is a fine example. As identified above, the number of “Unemployed” swelled by 500k. However, nearly that exact number came off the Not in Labor Force total. These are potential workers who have left the sidelines, looked for work and simply not found it yet! This is a VERY GOOD sign, not a negative as some have portrayed it already this morning. 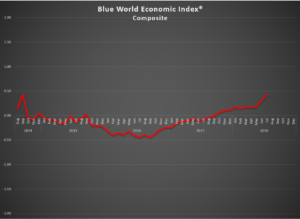 Blue World Economic Index® won’t post a report this month as we are in the middle of doing quarterly trend analysis and there are a great many changes. We can tell you the index rose at the highest rate since we began publishing and smashed the previous record high water mark. We’ll post the full update at the end of July and we’ll have plenty to say about tariff and trade wars then. We hope the 4th was safe and wonderful. Enjoy the rest of your summer!